Tire Crystal is developed especially for rubber and tires. So far, there has been not much changes in development in tire coating chemicals for ages, although tires have the significant impact for the outlook of the car. In addition to this, due to recent developments of tires itself, we found some cases that it’s likely to occur the excessive tire wax gets scattered around while driving and they cause stains on car surfaces which are really hard to be removed. SENSHA invented a method to encounter this problem and made a special ingredients for tire coating and developed the new style of tire coating. Much better & glossy: With ultra-high-density special silicon resin, the coating provides excellent finish like a brand new tires and restores the deep and shiny black color. Durability: By using normal car wash products, the coating will last approximately 60 to 90 days. Safety: Tire Crystal is solid type, not liquid so that scattering will not occurred. In addition, it does not contain any ingredients such as surfactants and solvents that can be damage the tires. Tire Crystal has been developed specifically for rubber and tires. There were not much changes in development in tire coating chemicals for decades, although tires have the significant impact for looks of a car. In addition to this, due to recent developments of tires itself, it is likely to occur that excessive tire wax gets scattered around while driving and they cause stains on car surfaces which are really hard to be removed. SENSHA had a drastic revision of ingredients for tire coating and developed the new style of tire coating. Gloss: With ultra-high-density special silicon resin, the coating provides the finishing like new tires and restores the deep and shiny black colour. Durability: By using normal car wash products, the coating will last approximately 60 to 90 days. Safety: Tire Crystal is solid type, not liquid so that scattering the coating agent will not occur while driving. In addition, it does not contain any ingredients such as surfactants and solvents that can be damaging tires. Tire Crystal, unlike traditional tire wax, does not contain surfactants and solvents which cause damages to tires (antioxidants). The product creates the tough and flexible coating film with ultra-high-density special silicon resin to endure harsh environments around tires. The coating film also provides the luster and deep look like new tires with water repellent, oil repellent and antifouling performance. 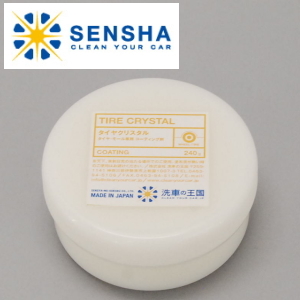 Tire Crystal is totally different from traditional tire wax, it is solid type, not liquid so that there are no scattering the agent to a car body, hence, not making stains on the car body. Please do not use Tire Crystal excessively, it might cause scattering around while driving. It is recommended to apply 1 gram for one tire. In order to have the best completion, please coat and spread a small amount. Many tire waxes sold in shops contain a large amount of surfactants to enhance a cleaning power.If you use these products, they melt antioxidants in rubbers of tires and creates a different chemical compound. This compound has the high infiltration of any materials. Therefore, when those high-surfactants-contained tire waxes are over applied resulting in generating this compound, the compound will be spread around a car body and make stains on the surfaces that could be extremely hard or impossible to be removed. This kind of incident actually happens more often after materials of tires have been redeveloped. It likely happens more often while tires and car body surfaces are new. Car dealers and shops are experiencing the incident and acknowledge those cases. Our tire wax series (Aqueous Tire Wax / Oleaginous Tire Wax / Oleaginous Professional Tire Wax) do not contain surfactants at all or use a minimum amount of it to reduce a possibility of melting antioxidants as much as possible. Therefore, it is totally safe to utilize the products, unless an excessive amount of the products is applied to tires.